One Eleven will cover tables with linens for dinner service but still offer a casual, rustic feel. The Capital Hotel’s new flagship restaurant, One Eleven, opens to the public today for dinner service, a significant departure from the former Ashley’s in both dining room and back-of-house kitchen design. According to Nick Bradley-Hole, director of the hotel’s rooms division, it was just what the space needed. A preview event features both daytime wooden tables and those covered in linens for evening. Gone are the dark paneling, gilded artwork and large divider in the middle of the room. The space, while still fairly formal, breathes more deeply with light walls, modern artwork and lots of light. 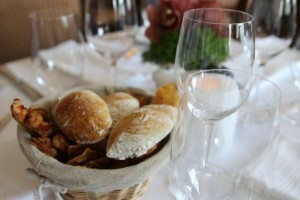 During the day, the wooden tables will have no tablecloths; at night, linens will reappear, but the mood is still light. According to Bradley-Hole, this was exactly the plan, making the space more attractive to repeat diners who no longer need to plan ahead for a visit to the space, especially at lunchtime. 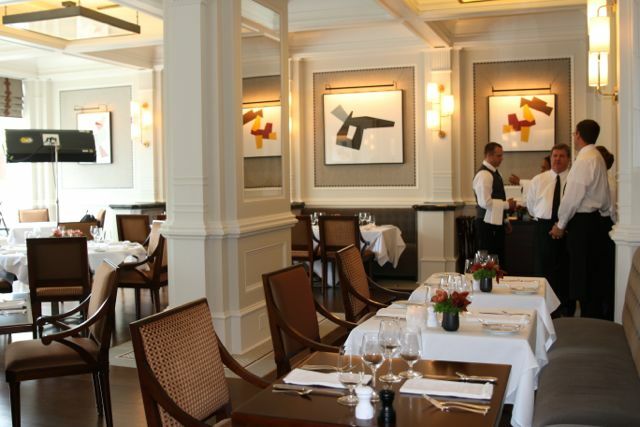 According to Capital’s Marketing Director Chuck Magill, the restaurant’s departure from formality was discussed in early talks with executive chef Joël Antunes before the renowned chef came on board in 2012. The new One Eleven back of house layout hums with efficiency. Magill also reported that the new chef’s requests included a kitchen renovation, bringing the enormous, far-flung space into more manageable stations. The former layout was more suited to à la minute, or cooked-to-order dining, most commonly used in very formal, low-volume spaces. With the hotel’s desire for increased volume and more approachability, the kitchen had to change. 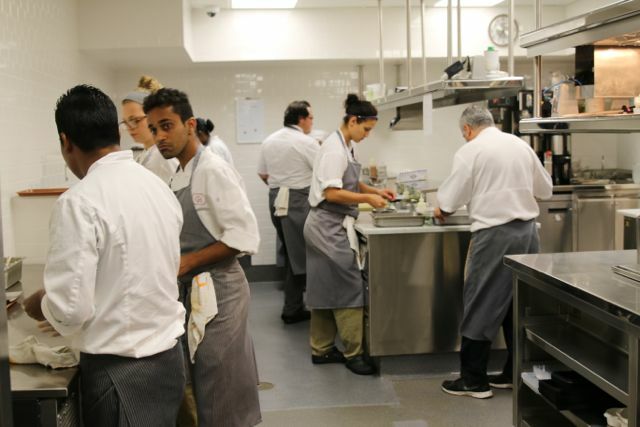 During last night’s preview tasting, the redesigned kitchen was a den of quiet focus. Antunes and sous chef Marc Guizol led their culinary team quietly with the occasional directive or question. The new station layout was working already, Antunes explained. Three months previously, many of the same writers at last night’s preview saw the “before” picture of the kitchen in action. While the culinary team still exuded professionalism and efficiency, the size of the space seemed to get in the way. Cooks leapt across the space to accomplish tasks that are now efficiently organized into compact stations. 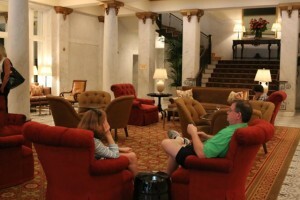 Guests recline in the newly re-outfitted, more casual lobby of the Capital Hotel. Much of Chef Antunes’ menu remained constant from Ashley’s to One Eleven, with a few new additions and tweaks. Last night’s preview menu included smoked salmon, pickled beets, risotto, pork cheeks and roast chicken, all in tiny preview bites that left diners swooning. New items include lobster, prime New York strip and cowboy ribeye. The prices have gone down a notch, mostly in the range of mid-twenties for meat-based dinner entrees (excepting the new strip and ribeye dishes, $44 and $59, respectively). One Eleven will also place a renewed emphasis on the $16 “Express Lunch,” using bento-style serveware for a quick yet elaborate treat including soup, a starter, main course, cheese, bread and dessert. The new bar is revealed, to also be used for coffee service. New to the menu and the space as a whole is the addition of an enormous coffee bar, part of an effort to encourage patrons to casually linger in the historic hotel’s marbled lobby area. Stuffy, Victorian-style lobby seating has been replaced with padded, conversation-grouped casual chairs, with tiny tables for sipping affordable coffee ($3.50 for a latte) and dining on bites served from the One Eleven breakfast or tapas menus. 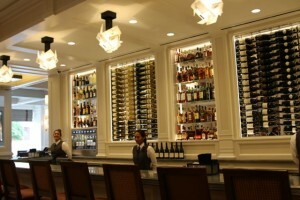 In the evenings, the brightly-lit, zinc-topped bar becomes a full wine, liquor and cocktail bar, complete with a new $10,000 vacuum-sealed wine dispenser to offer pricer items more affordably, by the glass. What do you think of the new FOH and BOH designs at One Eleven? What do you think about the future of formal dining? Leave your comments below.